Your students will have a terrific first day and discover some positive ideas about school and their classmates when they brainstorm some school symbols and then read a letter from you. 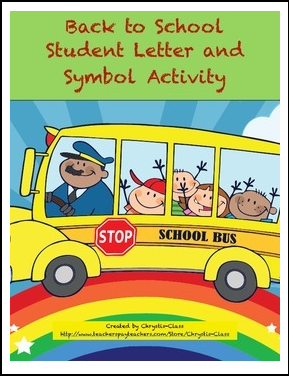 This activity includes a lesson plan with directions, optional symbol pictures to help students understand the concept, and a color or black & white heart warming letter from you. An optional brown bag of the items listed in the letter is suggested. This activity is part of a larger bundle of printables, forms, posters, name plates, activities, lesson plans, bulletin board ideas, and student surveys. Click on the link below to save $.